Growing up, Bushnell’s mother filled their home with family rituals and things that gave them meaning; including myth and fairy tales, poems before dinner, and seasonal celebrations such as May Day. As a result, Bushnell feels she was primed for using myths with new parents, which is a rich addition to her existing field of work. Though she eventually stopped working with England in 2009, Bushnell knew she was not yet finished finding meaning through the use myths, storytelling, and archetype, and when she stumbled across the Mythological Studies Program at Pacifica, she was hooked. Once enrolled in the program, virtually every course she took, each book she read, and nearly every lecture she attended reconnected her to the topic of childbirth, she recalls. “You can say that the lens through which I gazed during my entire time at Pacifica was entirely tinted by my work in the field of childbirth,” she offers. All of the notes she made throughout her coursework led right into her dissertation, which ultimately broadened the work she had already begun before attending Pacifica. Since then, the diversity and richness she gained during her studies has deepened and expanded to where she feels the connection between mythology and childbirth is so ready to be shared with a larger audience that it’s virtually “burning a hole” in her. Britta recently presented at the DONA International Conference, and at the MANA/CAM Midwives Conference in Long Beach, CA. As to that connection, the archetypal idea of a “rite of passage” is an overarching piece of how she sees the journey through labor into childbirth and further into new parenthood; her work has evolved into preparing parents for birth as a rite of passage. When Bushnell works with soon-to-be parents, she uses mythological stories such as goddess and god, Artemis and Apollo, and parts of their birth. Bushnell borrows her definition of mythology from Professor Ira Chernus at University of Colorado at Boulder, who regards mythology first and foremost as a story, but one that can be either explicitly or implicitly told. As a result of her work at Pacifica, Bushnell started turning a mythology lens to her own (American) culture. She began to ponder which stories we hear and live in our daily lives that are the type to be passed along from mother to daughter, or parent to child. Further, she wondered, how do those particular myths impact how we give birth in this culture? These kinds of stories offer a map for the rite of passage—the transformation that happens during the process of moving from being an individual to being a parent. Stories can help us locate ourselves within the context of something bigger than ourselves. It is critical for those who are experiencing childbirth or parenting for the first time to be able to understand where they are in their process and how they can potentially move forward on a given path. Bushnell likes to use the term “transfiguration” to describe the process of becoming a parent because much like a caterpillar that enters into a chrysalis and then comes out a butterfly, the transition for new parents requires a complete disillusion of self. 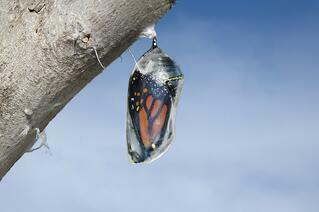 The caterpillar literally dissolves inside the cocoon in order to become something else entirely. In that transformation for new parents, there is something new that sprouts, which is anentity called “parent,” Bushnell believes. She likes to help them understand the process of transformation in a way that doesn't feel too personal, but which is at the same time, deeply personal. Using birth stories to help parents prepare to give birth offers a very individualized approach to one person's experience. When Bushnell employs the mythological story of the goddess Artemis and her twin brother Apollo, she focuses on how Artemis is widely viewed as the goddess of childbirth, and yet, she is a virgin goddess. This seems contradictory, Bushnell notes, because how could a virgin goddess be a goddess of childbirth? 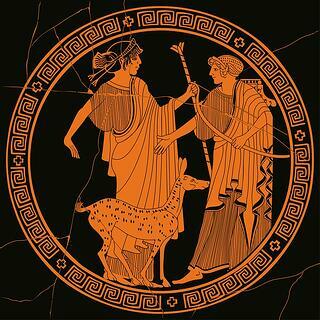 Yet, Artemis is the goddess of wild things, of the wilderness, and of those aspects that live outside the bounds of civilization, and therefore she offers a critical piece to understanding what every woman must find within herself to give birth—a stripping away of the social self. In mythological terms, Artemis does not care what other people think of her, Bushnell relates. She is close to the “life and death and the dirt and the seasonal and natural chaos that exist outside of civilization.” That perspective is essential for an individual to give birth. On the other hand, the twin brother of Artemis, Apollo is “all that is cultured, all that is ordered, all that makes sense in a way that we can understand rationally.” This is a reflection of the fundamental thoughts of the current culture we live in, Bushnell proffers. We live in a culture that values an Apollonian worldview and it can be helpful for parents-to-be to recognize that—and yet, to also connect with the Artemesian energy in the birth process. There is an opportunity to explore both aspects together, like two sides of the same coin. We can benefit from living in an Apollonian-cultured society that has tools originating from great study and science, while at the same time engaging those tools in conjunction with the deep rawness that is the natural energy of the forest or the wilderness. There can be a tendency, especially in the natural birth community, to see the medical establishment as the enemy, Bushnell states. However, the rational Apollonian component and the natural Artemesian perspective both have great value, and the transformation occurs when parents-to-be figure out how to combine the two in a way that will support their profound transformation. As a rule, Bushnell offers this wisdom in group settings. People sign up for childbirth education classes, though they don't always know that they are going to be getting something more than basic education. In fact, it is preparation for an embodied experience that is psychological and spiritual as well as knowledge-based information, notes Bushnell. She also works privately with individuals and as a coach for professionals in order to help them do this work with clients. In addition to specific processes that she utilizes with clients, Bushnell also has a deep understanding of symbols, archetypes, and mythology that tends to appear when she is teaching. For example, when an expecting mother starts talking about wanting to maintain her social self during childbirth—perhaps planning on having a lot of people there with her, but also worrying about how she will be able to show up socially during the process of giving birth—the mythological Artemis and Apollo may offer some guidance. In her classes, one of the first things Bushnell does is fall to the floor and act out a 60-second demonstration of a contraction, she tells me. As she breathes, moans, howls, and cries—doing her best to embody many possibilities of what a contraction in labor might look like—everyone’s eyes tend to open wide, she laughs. The demonstration inevitably leads to conversation about the Artemesian energy that comes out during birth. Bushnell is aware that her role is helping new parents prepare for childbirth and to step into their role as a parent—to move from child-like energy to parent-like energy. 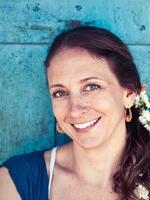 She aims to help her clients archetypally birth themselves as parents. As she sees it, it is her job to ask them questions that will guide them in finding what is important so that they can become parents, rather than maintaining the role of a child who seeks outward to find knowledge. They need to embody their inner expert, she insists, to know who they are as a parent and what is important to them. In each couple’s or individual’s process, she hopes they might experience the transformation for themselves, as each is uniquely different. The rite of passage is different for everyone. For one couple, going through labor might focus on the intensity of pain, and stripping away the notion of being socially acceptable. 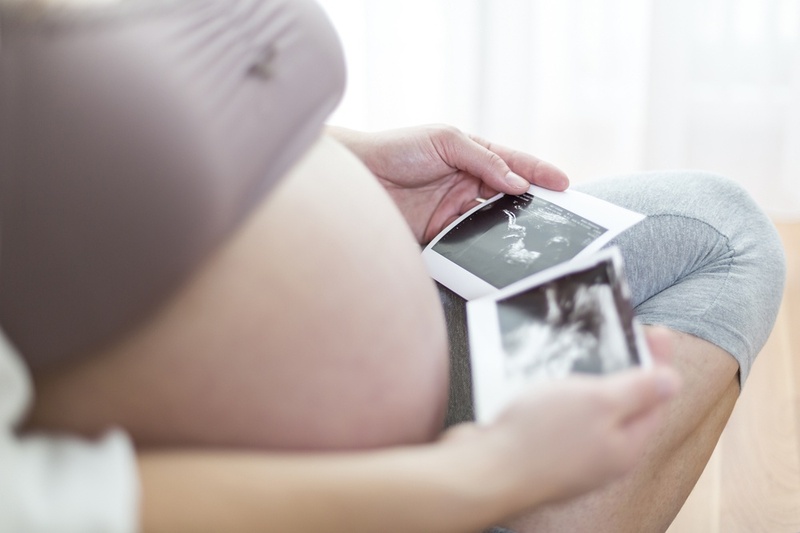 For another couple, it might be planning to experience a home birth with a midwife, only to discover at 36 weeks of gestation that they have to alter their plans for a caesarian birth. The mythological perspective can help give each couple context and understanding to a brand new, unexpected process of becoming parents. Bushnell is also aware that this focus on embodiment, or the capacity to embody our inner expert, may be helpful as something new tries to be birthed into our culture; a process which can be powerfully aided if we are able to use a mythological and archetypal approach. Currently, Bushnell is focused on completing her upcoming book, which targets both parents and birth professionals. Based on research from her doctoral dissertation, the book explores inherent cultural myth in American childbirth, including our inevitable desire for control and the need for certainty in the birth process. A mythological perspective can illuminate the many ways in which these big stories we tell ourselves are unconscious for parents-to-be. Understanding and acknowledging that these myths are at work in our lives can provide a new way to move through birth and into new parenthood with the wisdom gained through that ordeal, Bushnell points out. When addressing the desire for control and the need for certainty from a rite-of-passage perspective, one comes to “openness to the unbidden”, a term she borrows from theologian William F. May. Being open to that which we did not choose endows us with a valuable perspective that is greatly needed in both parenthood and culture. Being open to the unbidden, for me, feels like the Buddhist idea of non-attachment and an allowing of open space in which soul can enter and transform us—a valuable prospect for each of us in the process of birthing ourselves and contributing to a society that is healthy and whole. Learn more about the M.A./Ph.D. 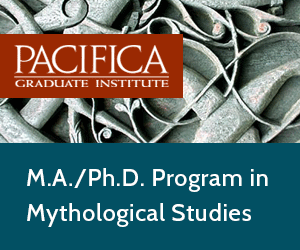 in Mythological Studies at Pacifica at Pacifica. Britta Bushnell, Ph.D., is an award-winning childbirth educator, a celebrated speaker, and specialist in guiding audiences to new approaches to childbirth, relationship, and parenting. She holds a bachelor’s degree in psychology from University of California at Irvine and a master’s degree and PhD in Mythological Studies from Pacifica Graduate Institute. In her doctoral dissertation entitled, Forceps and Candles: Cultural Myths in American Childbirth, Britta explores several core ideals influencing current medical and natural birth practices in predominantly unexamined ways by consumers and providers alike. While she continues her work with new families, Britta is currently deep at work writing her forthcoming book birthed from her doctoral research, entitled: Forceps and Candles: Illuminating cultural ideas to transform the experience of childbirth. Having worked with new families for almost two decades, Britta blends her experience with parents during the childbearing year with her doctoral study in mythology and psychology, bringing a fresh approach to an age-old human experience. Using mythology, storytelling, symbols, archetypes, and ritual as her primary tools, Britta challenges hidden preconceptions and helps individuals, parents, and professionals cultivate new ways to approach life’s most important transitions. When not pursuing her passions for childbirth, myth, and ritual, you can likely find Britta exploring the world or on the mountain slopes attempting to keep up with her husband, Brent and their teenage sons, Kaden and Rumiah. Bonnie Bright, Ph.D., is a graduate of Pacifica’s Depth Psychology program, and the founder of Depth Psychology Alliance, a free online community for all who are interested in depth psychologies. She also founded DepthList.com, a free-to-search database of Jungian and depth psychology-oriented practitioners, and she is the creator and executive editor of Depth Insights, a semi-annual scholarly journal. Bonnie regularly produces audio and video interviews on depth psychological topics. She has completed 2-year certifications in Archetypal Pattern Analysis via the Assisi Institute and in Technologies of the Sacred with West African elder Malidoma Somé, and she has trained extensively in Holotropic Breathwork™ and the Enneagram.